Avian influenza, sometimes avian flu, and commonly bird flu, refers to "influenza caused by viruses adapted to birds." Of the greatest concern is highly pathogenic avian influenza (HPAI). "Bird flu" is a phrase similar to "swine flu", "dog flu", "horse flu" or "human flu" in that it refers to an illness caused by any of many different strains of influenza viruses that have adapted to a specific host. All known viruses that cause influenza in birds belong to the species influenza A virus. All subtypes (but not all strains of all subtypes) of influenza A virus are adapted to birds, which is why for many purposes avian flu virus is the influenza A virus. Adaptation is non-exclusive. Being adapted towards a particular species does not preclude adaptations, or partial adaptations, towards infecting different species. In this way strains of influenza viruses are adapted to multiple species, though may be preferential towards a particular host. For example, viruses responsible for influenza pandemics are adapted to both humans and birds. Recent influenza research into the genes of the Spanish flu virus shows it to have genes adapted to both birds and humans; with more of its genes from birds than less deadly later pandemic strains. There are many subtypes of avian influenza viruses, but only some strains of four subtypes have been highly pathogenic in humans. These are types H5N1, H7N3, H7N7 and H9N2. PB2 Amino acid (or residue) position 627 in the PB2 protein encoded by the PB2 RNA gene. Until H5N1, all known avian influenza viruses had a Glu at position 627, while all human influenza viruses had a Lys. HA Avian influenza hemagglutinin (HA) bind alpha 2-3 sialic acid receptors while human influenza HA bind alpha 2-6 sialic acid receptors. Swine influenza viruses have the ability to bind both types of sialic acid receptors. Hemagglutinin is the major antigen of the virus against which neutralizing antibodies are produced and influenza virus epidemics are associated with changes in its antigenic structure. This was originally derived from pigs, and should technically be referred to as "Pig Flu". 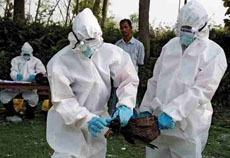 Pandemic flu viruses have some avian flu virus genes and usually some human flu virus genes. Both the H2N2 and H3N2 pandemic strains contained genes from avian influenza viruses. The new subtypes arose in pigs coinfected with avian and human viruses and were soon transferred to humans. Swine were considered the original "intermediate host" for influenza, because they supported reassortment of divergent subtypes. However, other hosts appear capable of similar coinfection (e.g., many poultry species), and direct transmission of avian viruses to humans is possible. The Spanish flu virus strain may have been transmitted directly from birds to humans. In spite of their pandemic connection, avian influenza viruses are noninfectious for most species. When they are infectious they are usually asymptomatic, so the carrier does not have any disease from it. Thus while infected with an avian flu virus, the animal doesn't have a "flu". 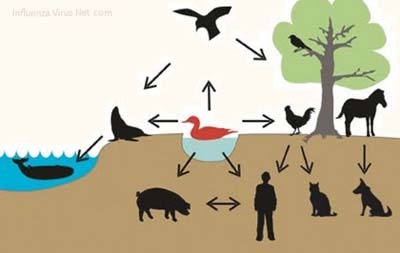 Typically, when illness (called "flu") from an avian flu virus does occur, it is the result of an avian flu virus strain adapted to one species spreading to another species, usually from one bird species to another bird species (see figure 1). Figure 1. An example of antigenic shift of avian influenza virus. Arrows represent the passage of the virus from one species of host to another. So far as is known, the most common result of this is an illness so minor as to be not worth noticing (and thus little studied). But with the domestication of chickens and turkeys, humans have created species subtypes (domesticated poultry) that can catch an avian flu virus adapted to waterfowl and have it rapidly mutate into a form that kills in days over 90% of an entire flock and spread to other flocks and kill 90% of them and can only be stopped by killing every domestic bird in the area (see figure 2). Until H5N1 infected humans in the 1990s, this was the only reason avian flu was considered important. Since then, avian flu viruses have been intensively studied; resulting in changes in what is believed about flu pandemics, changes in poultry farming, changes in flu vaccination research, and changes in flu pandemic planning. Figure 2. Chickens are a potential resevoir for influenza viruses, like H5N1. To minimize the presence of highly pathogenic avian influenza (HPAI) during an outbreak in poultry, any bird found with antibodies to avian influenza virus will be eradicated. H5N1 has evolved into a flu virus strain that infects more species than any previously known flu virus strain, is deadlier than any previously known flu virus strain, and continues to evolve becoming both more widespread and more deadly causing Robert G. Webster, a leading expert on avian flu, to publish an article titled "The world is teetering on the edge of a pandemic that could kill a large fraction of the human population" in American Scientist. He called for adequate resources to fight what he sees as a major world threat to possibly billions of lives. Since the article was written, the world community has spent billions of dollars fighting this threat with limited success. Vaccines have been formulated against several of the avian H5N1 influenza varieties. 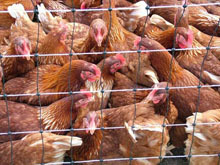 Vaccination of poultry against the ongoing H5N1 epizootic is widespread in certain countries. Some vaccines also exist for use in humans, and others are in testing, but none have been made available to civilian populations, nor produced in quantities sufficient to protect more than a tiny fraction of the Earth's population in the event that an H5N1 pandemic breaks out. The World Health Organization has compiled a list of known clinical trials of pandemic influenza prototype vaccines, including those against H5N1.